The first Hamilton model to feature a calendar complication was introduced in 1954, the same year the Hamilton Illinois line introduced a calendar model - the Datomatic A. The Hamilton version was the Automatic K-575 Calendar. 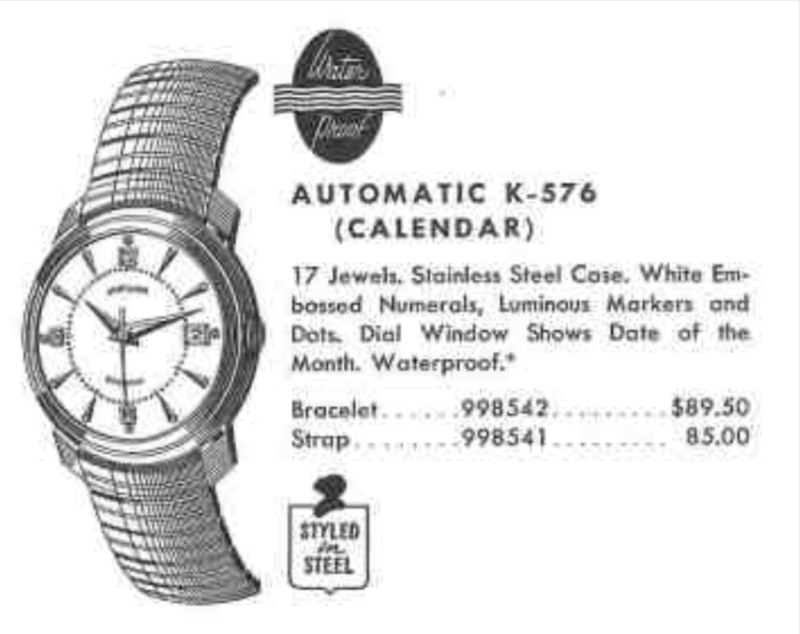 The following year the catalog image for the K-575 was slightly different. The 1954 version appears to have bands around the outside perimeter while the 1955 version lacks the bands but has luminous dots outside the 12, 3, 6 and 9. That leads me to believe there are two dial variations for the K-575. It also appears that the date wheel on the 1954 model is darker than on the 1955 version... indicating the date wheel is a different color than the dial. 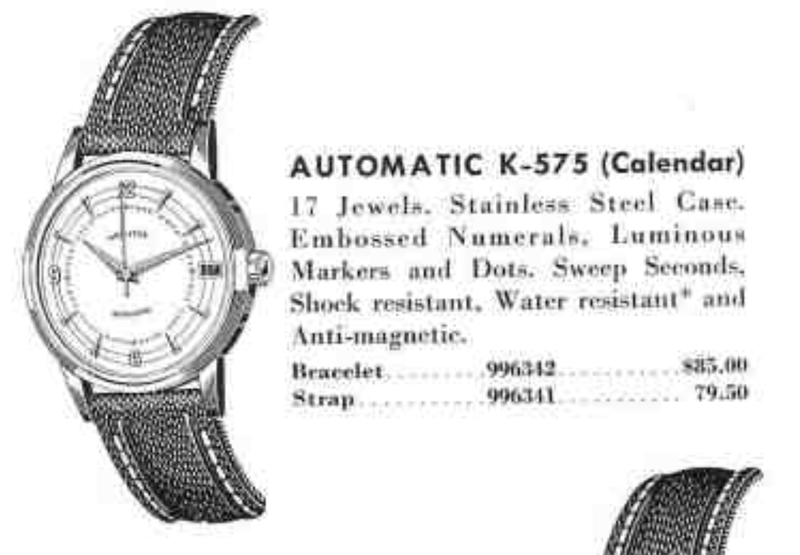 The 1954 catalog shows the strap while the 1955 version shows the bracelet that was paired with the K-575. Another calendar model was introduced in 1955, the Automatic K-576, and features the same dial as the 1955 version of the K-575. The other very popular K-series automatic with a calendar complication is the 1960 K-475. That model is the only model to use the Hamilton 690 movement. The earlier K-575 and K-576 used the earlier version of the 690, the 662 - and it uses all of the same parts as the 690 other than the rotor. You very rarely see the K575 or K576 in the wild. I'm not sure why that is. However, in the last few months I came upon two identical K575s and I purchased them both since parts can be hard to come by. I figured I would restore the better of the two. The case back screws on and off and is a solid chunk of stainless steel. From the back the back, the 662 is identical to the 661. Nothing new to see here. The dial is in fair shape but a bit grungy. Once the dial is removed, it exposes a cover that has to be removed in order to expose bits that make the calendar complication do it's thing. It's running a little slow but that is easily corrected. One of the examples has a crystal with a silver reflector ring. I think it looks very authentic so I will install a new crystal with a silver ring. My white light tent is merciless on watches and it makes my completed project watch look a little splotchy. It looks better in person. Still, I may swap it with the dial from my other example... it's a little more even but also a bit grungy. 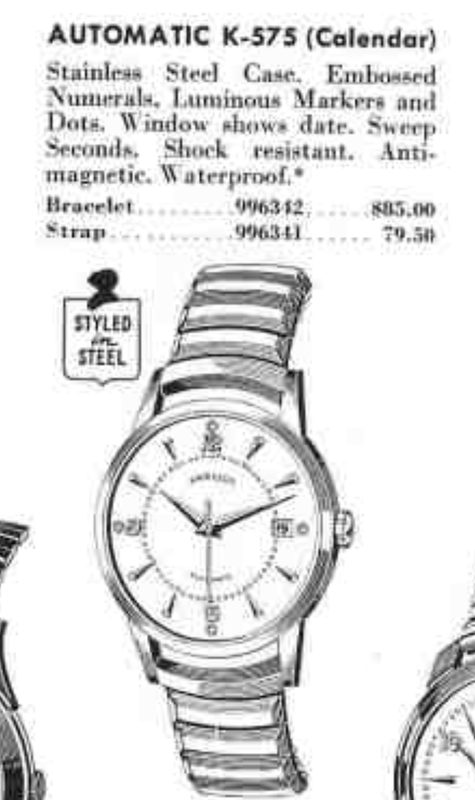 This is such an uncommon watch though that keeping it original is a good idea.